Exercise & Lifestyle - Dr. Claudia Laufer, DAOM, L.Ac. It is well-known by now that a regular exercise regime is an important part of health. 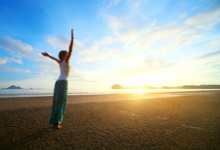 By moving our bodies, we are moving our energies and hence prevent blockages. It keeps our heart healthy, and is a major factor in controlling chronic diseases like Diabetes. Still, many Americans don't get the exercise they need. They spend hours sitting in front of computers, televisions and work desks, often in poor ergonomic positions, and over the months and years, the substantial blockages that build up under these conditions lead to painful ailments and health problems. Just 30 minutes of exercise a day can prevent many common ailments, and help in managing stress. Meditation is another useful tool in balancing the body and alleviating stress. There are many different forms of meditation, and not all require you to sit still for extended periods while calming your mind. Tai Chi and Qi Gong are both forms of moving meditations, which means that you meditate while you exercise. During moving meditation, you focus your mind on every move and every breath and every body part, bringing the three realms of body, mind and soul together. Yoga is another form of movement that helps in calming the mind while gently exercising the body. Moving meditations are great for people who have a hard time with the still meditations and an overactive mind. •	Start going for a brisk 15-minute walk after dinner, and if you have time after lunch, do the same. Evening walks are a great way to get kids involved in exercise as well! •	At work, get up every hour and move around a bit. Make sure to move all your joints, especially the neck and shoulder areas, since this is where a lot of tension is held. •	Find an exercise buddy and commit to an evening walk or short weekend hikes. It is much easier to stay motivated to exercise if you have a partner to do it with! •	Check out your local community center or check with your health care provider for Tai Chi, Qi Gong or Yoga classes in your area. It is a great way to stay healthy and make new friends. •	Make your exercise goals realistic, and think baby steps. It is much easier to do a 10-minute walk regularly after meals than it is to start with a plan to go work out for an hour at the gym every day. Setting your goals smaller and slowly building them up helps you develop good habits much easier, and you don't set yourself up for failure by trying to accomplish too much too soon. Every day, we make choices in regards to how we live our lives: what we eat, when we sleep, what we do with our free time, and so on. Unfortunately, in our busy and stressful world, many of those choices are quite unhealthy and work against our health rather than for it. Many health problems are rooted in poor lifestyle choices. Insomnia, for example, is often related to irregular sleep schedules, using electronically devices in bed, eating too late, and other sleep "hygiene" issues. While it can be challenging to make better choices amidst our hectic days, with awareness and baby steps, it is possible. Try to go to sleep and wake up at the same time every day, including weekends. Avoid electronic media directly before bedtime. Also, keep electronic devices like phones, computers and televisions out of your bedroom. If you use an alarm, keep it as far as possible from your head and your bed. Don't toss and turn for more than 20 minutes when trying to go to sleep. If you can't go to sleep within 20 minutes, leave your bedroom and pick up a monotonous, boring activity (like folding laundry or reading a boring book). After 20 to 30 minutes, go back to bed and try to sleep again. A hot epsom salt bath with lavender essential oils (or any other calming oil) 30 minutes before bedtime can work wonders. If you don't have the time or space for a bath, soaking your feet in hot epsom salt water with essential oils will help as well. Don't eat right before bedtime. When you sleep, your body is supposed to maintain your body, not digest food. Ideally, your last meal should be light and be consumed by 7 pm latest. If you wake up during the night for bathroom breaks, try to avoid drinking water or tea after 6 pm.